As succinctly stated by Hickey (1984), land plants form a central element in any comprehensive inquiry into possible causes of extinctions at the K-T boundary because they are a conspicuous and exposed part of the terrestrial biota. Plants are speciose and common on terrestrial landscapes. They are primary producers, composing the base of the food chain. The fate of terrestrial animals depends upon them, either directly or indirectly, as food sources and for shelter; thus, the collapse of plant communities would cause the collapse of entire ecosystems. Unlike animals, plants are fixed in position on the landscape and cannot escape sudden deleterious changes in the environment. They are directly linked to atmospheric chemistry, temperature, and humidity and hence they reflect climate and are exquisitely sensitive to changes in it. Add to these essential aspects the fact that plants tend to be commonly preserved as fossils. Fossil plants also have biostratigraphic utility and they can be used to locate the stratigraphic position of the K-T boundary with great accuracy and precision. 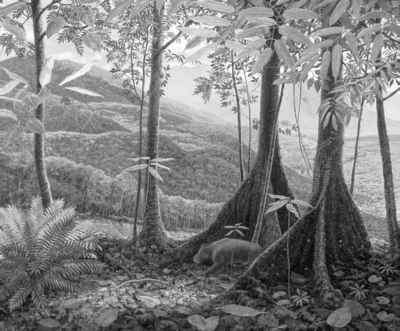 Thus, fossil plants are available for study, and they are the very organisms that have enormous potential for revealing critical information about the nature and effects of the K-T extinctions. 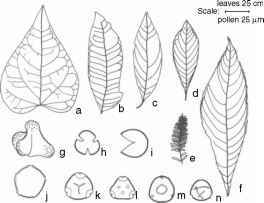 Figure 1.2 Sketches of typical fossil leaves and pollen from Maastrichtian, Paleocene, and lower Eocene strata in Montana and Wyoming, USA (from Nichols et al. 1988). a - Paranymphaea crassifolia, b - aff. Averrhoites, c - Lauraceae, d - Pterocarya glabra, e - Metasequoia occidentalis, f - "Carya" antiquorum, g - Aquilapollenites quadriiobus, h - Tricolpites microreticulatus, i - Taxodiaceaepollenites hiatus, j - Polyatriopollenites ver-montensis, k - Momipites leboensis, l - Momipites triorbicularis, m - Caryapollenites veripites, n - Platycarya platycaryoides. Reprinted with permission. 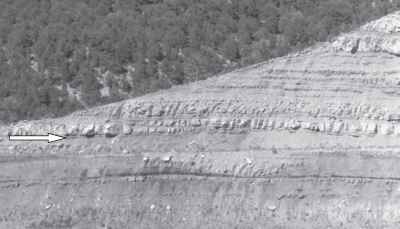 Figure 1.3 Photograph of a representative outcrop of the kinds of rocks of varied fine- to coarse-grained lithology that can yield plant microfossils and megafossils. The exposure has enough lateral and vertical extent to yield several sections for analysis. This outcrop, at Clear Creek North in the Raton Basin (see Section 7.2), actually contains the K-T boundary (see arrow). Photo by C. L. Pillmore, US Geological Survey. excel at stratigraphic age determination and correlation. Even though a given source vegetation produces both megafossils and microfossils, the resulting fossil records often contain strikingly different information. Where it is possible to employ both of these major kinds of plant fossils in investigations of the K-T boundary, each group supplements the other in revealing the nature of ancient plant communities and their fate as a consequence of the K-T boundary impact event. Figure 1.2 illustrates some plant megafossils (leaves) and microfossils (pollen) as generalized examples. Figure 1.3 shows an outcrop section that has yielded both plant megafossils and microfossils near and at the K-T boundary, bearing evidence of events that affected plants in latest Cretaceous and earliest Paleocene time.